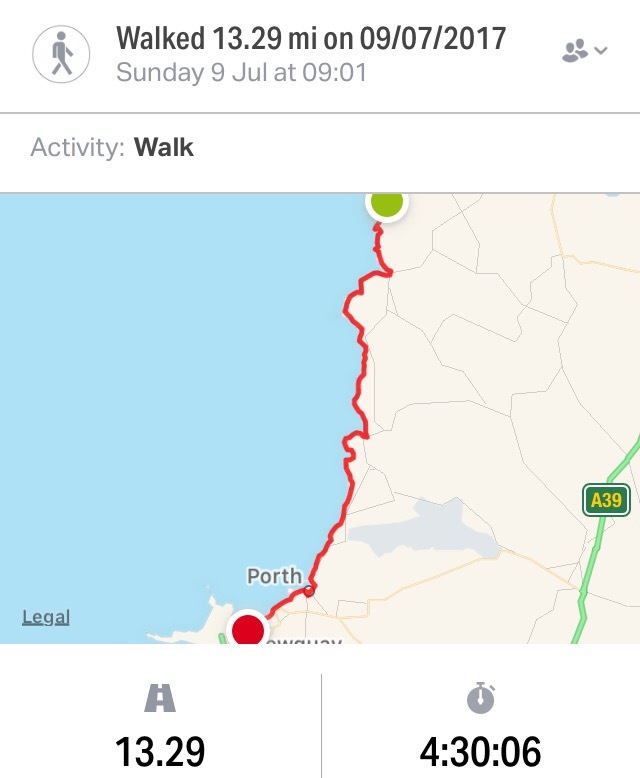 Today’s walk was very straight forward – easy walking along cliff tops with only the occasional gentle undulation, perfect weather conditions for walking with only a short-lived threat of rain blown in from the sea, no navigational challenges, and no shortage of places to stop off for drinks. We walked by Porthcothan, Mawgan Porth, and Watergate Bays – all super beaches – but the high spot of this stretch are the sands and striking rocks of Bedruthan Steps. Along the cliff tops are conservation areas for the endangered corn bunting. Above Bedruthan Steps Darren and I were on a gradual climb when I heard the cry ‘C’mon Cox, get up that hill!’, and there was Andrew, (Cannon, brother of Neil) who’d been ‘tracking’ us from Treyarnon. We had a welcome National Trust coffee and tea cake with Andrew, Lisa (née Cannon), and their partners Jill and John before continuing on our way. They’re all staying at Padstow and we’re having dinner together tomorrow in St Agnes. Newquay was the end of the trip for Darren and he took the train home. It’s been a good week, with the challenge of the tough three-day stretch from Hartland Quay to Port Isaac and no sight of Darren’s new, unopened waterproofs. I’ve just four more days on the road. My boots are ready to be laid off. The soles have thinned and lost their strength so I can now feel stones underfoot through the base. I think they’ll be consigned to gardening duties. Your emotions as you close in on the finish will be interesting. Not going back the other way are you………. “All by myself” (another earworm!) following so many social whirls. After so many walking days you will be walking in your sleep when it is all over! Countdown to the end, your last week. Amazing achievement. Hopefully it is more downhill than uphill to your final destination. Your boots haven’t done as well as I’d hoped, still, the end is nigh, head up and keep the sea on your right…. Sounds like the definition of a perfect stretch: ‘easy walking with plenty of places to stop for a drink’. I hope the boots hold up….keep it going…you must be getting excited as the end of your long trek beckons….. I still say complain about the boots, they have let yo down so badly! Can’t believe you are so near the end! Party time when you come home! Sorry for lack of supportive posts – have been away in the 3rd world country radio-dead-zone that is Scotland. Nearly there… best foot forward and all that. Have a great last couple of days. . Have you thought of continuing your walk??? back to Salisbury.. We will miss the blog!